As the shipping industry continues its push to reduce emissions to air, classification society DNV GL announced a new class notation for exhaust gas cleaning systems (EGCS). The new notation, Emission reduction (ER), will cover not only scrubbers for removing SOx, but selective catalytic reduction (SCR) and exhaust gas recirculation (EGR) systems for removing NOx. The new notation will be published in July 2018. The class notation sets out requirements for the design and arrangement of EGCS, SCR and EGR systems, including the piping systems conveying wash water and/or treatment fluids, the exhaust arrangements and components, control, monitoring and safety systems as well as manufacture, workmanship and testing. The ER class notation is a natural complement to DNV GL’s Scrubber ready notation, released in 2016, which enabled shipowners to prepare their newbuildings for the installation of a scrubber, giving them confidence that they were prepared for a smooth and cost-efficient scrubber retrofit. With ER, shipowners can now have the same confidence in the installation and operation of their new emission reduction systems. 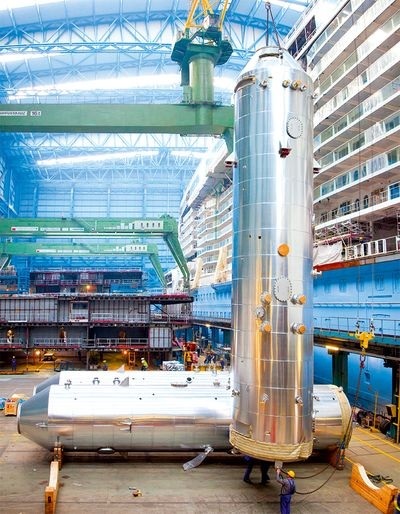 Caption: Scrubbers ready for installation onboard Norwegian Escape at Meyer Werft. Photo courtesy of Yara Marine Technologies AS / ©Meyer Werft.